Benjamin Wetherby, Earl of Glastonbury and heir to the Marquessate of Eastleigh, has just received an urgent letter from home. His father is dying and he must return to England at once. Benjamin is a man bound by honor and duty, to both his country and his family. So, despite his reservations, he leaves his life in New York City behind so he may find a wife and assume his role as the Marquess of Eastleigh. Benjamin Wetherby, Earl of Glastonbury and heir to the Marquessate of Eastleigh, stared unblinkingly at the letter before him. It had been just under eleven months since he arrived in America, and now he was being summoned back to England. Father is dying, his sister wrote. Dying. Was that even possible? His father had been the picture of health the day he left Ravenscroft Castle, but now less than a year later, he apparently had precious few days left. As much as Benjamin was loath to return home, to leave the life he’d established in New York, he was duty bound. He could never ignore the position to which he’d been born. Besides, along with the title came great responsibility. Many relied on the marquess for their welfare, including his own family: his mother, his sister, his brothers. “Lillian, get up,” he called from across the room. His mistress stirred in the bed. Her blond curls stuck out from under the counterpane. She had been a comfort of sorts to Benjamin over the last few months, and he to her. Brought together by misery, they enjoyed one another’s company. But there was no room for a mistress in Ben’s life anymore. He had a duty to marry now, to find a woman who could serve as his marchioness. A woman reared in society, born and bred to the position as much as he had been. Phoebe Blake stared out of her second-story window as bolts of lightning lit up the rain-soaked streets of Berkeley Square. The water cascaded down the panes like a gushing waterfall, obscuring her view of the chaos in the streets. The storm had come on rather suddenly, and those caught without umbrellas ran for cover. Mud caked under horses’ hooves and carriage wheels, and to the hems of women’s dresses. She shivered, hopeful the storm would pass before the ball that evening. Phoebe turned to see her maid, Becky, in the doorway of her room. With a sigh, she followed her into the hallway. She poked her head around the edge of her mother’s bedchamber door. “Mama? Are you awake?” Her mother gave a tiny grunt, indicating she was not actually sleeping, so Phoebe proceeded into the room. Becky followed along behind with the luncheon tray while Phoebe pulled the heavy curtains back to let light in the room, the only room that was still fully furnished. Her mother shielded her eyes, even though there was no sun to shield them from, and rolled over to bury herself in her pillow. Phoebe sighed. Would she never see the end of her mother’s mourning? A year had gone by since Phoebe’s father had died. And every day her mother grew a little thinner. Much like their pockets. Just that morning, another notice had come from yet another debt collector. Her mother wouldn’t have known, but half their furniture had been carted away already, including the Broadwood piano that once sat in the parlor. That had been the worst of it for Phoebe, and the last straw towards her decision to re-enter society and find a rich husband. If she didn’t, they’d all be in the poorhouse within a few months. And that would be the final nail in her mother’s coffin, Phoebe was certain. She pushed the dilemma from her mind and focused on the task at hand: getting her mother to eat. It was not easily accomplished, and three times a day, Phoebe found herself nearly force-feeding a woman who would rather die than take a bite of mutton stew. Of course, Phoebe wouldn’t allow her mother to simply waste away, so she bore the task like a good daughter. She settled on the edge of the bed. “I’m going to a ball this evening, Mother,” she said as she spooned the first bite into her mother’s mouth. There was a pause as her mother tried to figure out how long it had been since the baron had died, but it wouldn’t matter if she sat there all day with her mind on the task. She had no idea how many days—months— had passed. Pain, clear as day and so horrible to see, passed across her mother’s face. She pushed the food away and turned her gaze to the window, but Phoebe knew she didn’t see anything in the street below. Her grief blinded her to all else. Resigned, Phoebe stood from the bed and left the room. Her mother would eat tomorrow. Phoebe’s head jerked in the direction of her maid’s voice as if she had some kind of nervous tic. She looked back to the mirror and studied herself intently. The image staring back was almost unrecognizable compared to the gangly, green girl she’d been not so long ago. A poised and reserved woman sat in her place now, though the nerves were comparable to those she’d suffered in her first season. However, she was not at all the same person. Since her father’s death, she’d grown up quite a bit, taking on the family finances—or lack thereof, in their case. And she’d somehow reversed roles with her mother, who couldn’t quite get past her grief. Never mind her father hadn’t been the most loyal of husbands or the most responsible with money. But, well, he had been educated at least. And somewhat respected amongst the ton, titled and landed, and . . . kind. If nothing else, he’d been a nice man. Phoebe stared at the white gloves Becky held out to her. They weren’t as white as they should have been, but she couldn’t afford new ones. They would have to do. “Do you think I’ve made the right decision?” Phoebe asked as the carriage trundled through the city streets. Phoebe shook her head, but offered no explanation. She’d long since given up any hope of her mother attending social functions with her. The woman could barely sit up in bed, let alone stand at the edge of a ballroom all evening. What Phoebe really wished was that she didn’t have to choose a husband based on his wealth and status, but rather for love. However, her situation didn’t afford her the time necessary to search for a soul mate. She just needed a husband who could keep them out of the poorhouse . . . or debtors’ prison. Not even her cousin Geoffrey, who had inherited the title of Baron Grimsby, could afford to save them. Heavens, what was wrong with her? Who cared about love and soul mates? If she didn’t act quickly, she’d end up with a Fleet Marriage in the middle of the Marshalsea prison yard. “Here we are,” Becky announced, bringing Phoebe from her thoughts. Her stomach flip-flopped as the carriage pulled to the front of Stapleton House. Goodness, it had been so long since she’d attended a social function. One year, to be exact. But she was prepared, thanks to countless nights pouring over Debrett’s The New Peerage during the last few weeks. Becky had insisted she refresh her memory and learn who was still available this season. Their conveyance stood in a short queue of coaches waiting to drop off the other guests. Phoebe leaned forward and pulled back the black velvet curtain to reveal the manor. It was one of the more grandiose London mansions, with great stone pillars and a marble staircase that led to the main entrance. One found it hard to believe such immense estates existed within the city’s limits. Especially when one lived in a minuscule townhouse. The carriage door opened moments later to reveal a refined footman dressed in gold livery. With his assistance, Phoebe stepped out and onto the drive, Becky close on her heels. She gathered her skirts between her fingers and fidgeted all the way up the stairs to the receiving line, until they stood face-to-face with their host and hostess, Lord and Lady Stapleton. In a desperate attempt to keep her dinner where it rightfully belonged, she greeted them and then waited to be announced to the room at large. Lady Stapleton had an obvious propensity for the color pink, though in reality, she ought not to have, for the color clashed painfully with the gilded ballroom. However, the lady’s horrific taste in decoration did not make the scene any less intimidating. Phoebe tried to gather her wits about her as the footman announced her name and then proceeded to the chairs at the edge of the dance floor. A few wallflowers had taken up their posts there, including her longtime friend Victoria Cunningham. Victoria’s dark brown curls bounced about her face, open and bright and genuine. Phoebe couldn’t stop the smile that came to her own lips. Phoebe looked around, taking stock of her competition, and swallowed her nerves. This was no time to doubt herself. Victoria was right. She’d never meet or marry a man to save them from destitution if she clung to the shadows all evening. So she bid her friend farewell and made her way to the refreshment table. Surely eligible gentlemen got thirsty at some point or another. “Well, if it isn’t my favorite cousin. I knew I’d find you here.” Benjamin approached his cousin Victoria and watched as her brown eyes lit with affection. Ben nodded. He had seen his father, though he didn’t look anything like the man he’d said goodbye to a year ago. “I’m surprised you didn’t stay there,” Victoria went on. Victoria turned speculating eyes on him. “Why?” she asked. Phoebe laughed as Mr. Potter, a handsome young man who hailed from Derbyshire, deposited her back into the hands of her maid. She had to admit she was having quite the time of her life this evening. She didn’t remember ever dancing with such fervor before or laughing quite so much. She’d obviously been holding it inside for far too long. He bowed over her hand and gave a smoldering look with his hazel eyes, which she was sure was only meant for her. Perhaps it wouldn’t be nearly as hard as she thought to find a husband this season. As Mr. Potter walked away, Phoebe noticed Victoria approaching. However, she was not alone. She glided to them on the arm of the most astonishingly handsome man Phoebe had ever seen up close. He was, for lack of a better word, beautiful. Slightly tanned, the jaw chiseled to perfection, his nose indicative of generations of good breeding in its aristocratic slope. And the rest of him . . . He stood at least six feet tall, with a slender and muscular build. His raven hair had been trimmed to a fashionable length, and a thick lock fell into his eyes as he bowed to her. The man was Adonis incarnate. Phoebe didn’t realize she was gawking until she felt a sharp jab to her ribs. Becky threw her a sideways glance and cleared her throat as if to say, Get a hold of yourself! She tried, she really did. But when the gentleman muttered a low, rumbling, “Good evening,” Phoebe was sure she must be drooling. “Y-yes, of course,” Phoebe stammered. He inclined his perfect head again, and Phoebe managed to execute what she hoped was a dignified curtsey. “Might I see your dance card, Miss Blake?” he asked, his low drawl thrumming through her veins. Wordlessly, she held up her wrist and offered the tiny pencil. When he was done writing, she withdrew her hand from his searing touch. He bowed again, and she responded with an awkward curtsey. After obtaining a degree in Vocal Performance from the Manhattan School of Music, and years of pursuing a career on the stage, Jerrica left the “glamorous” life of an actress in favor of writing romance. She continues to reside in the New York City area with her husband, cat, and ever-expanding belly, anxiously awaiting the arrival of the newest addition to their family. 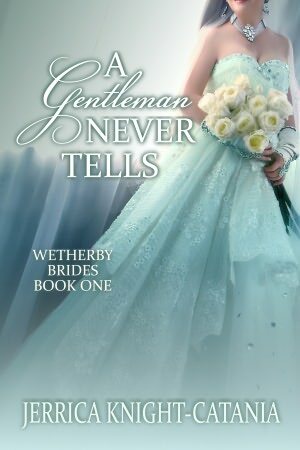 In the meantime, she continues to work on the fourth installment of the Wetherby Brothers’ Novels.